Our doctoral students are actively developing their teaching skills. Below are examples of their successes. Mitchell Johnston (Financial Management), Chao Gao (Financial Management), Mingtao Xu (Strategic Management), Dalee Yoon (Strategic Management), Anparasan Mahalingam (Strategic Management), Kubilay Cirik (Strategic Management), Logan Emery (Investment Management), and Roger Thomas Godwin (Tax Accounting) have received a Fall 2018 Krannert Certificate for Distinguished Teaching. Utsav Shenava (Marketing Management), and Yuanchen Li (Operations Management) have received a Fall 2018 Krannert Certificate for Outstanding Teaching. Okaro Shinn (Principles of Economics), Benjamin Angelo (Management Accounting I), and Rixing Lou (Management Accounting I) have received a Fall 2018 Krannert Certificate for Distinguished Recitation Teaching. Christopher Smith (Principles of Economics), Jieqiong Jin (Principles of Economics), Ann Chiaroni (Principles of Economics), LokTing Yim (Principles of Economics), and Victor Ferguson (Management Accounting I) have received a Fall 2018 Krannert Certificate for Outstanding Recitation Teaching. William Brown (Game Theory), Zhaojing Chen (Financial Management), Debasmita Das (International Trade), Somnath Das (Microeconomics), Yuanchen Li (Operations Management), Abhishek Ray (Management and Information Systems), Lindsay Rosokha (Introduction to Organizational Behavior), Lu Wang (Macroeconomics), Chen Wei (Behavioral Economics), Yifei Xu (Microeconomics), and Xuewen Yu (Econometrics) have received a Summer 2018 Krannert Certificate for Distinguished Teaching. Xioatian Liu (Money and Banking), and Andrew Steckley (Microeconomics) have received a Summer 2018 Krannert Certificate for Outstanding Teaching. Dalee Yoon (Strategic Management), Mingtao Xu (Strategic Management), Michael Woeppel (Financial Management), Martina Loderer (Marketing Management), Jongsoo Kim (Strategic Management), Jong Gwang Kim (Management Science), R. Thomas Godwin (Practicum in Taxation), Chao Gao (Financial Management), Kubilay Cirik (Strategic Management), and Joonhyung Bae (Strategic Management) have received a Spring 2018 Krannert Certificate for Distinguished Teaching. Tianfu Wang (Marketing Management), and Utsay Sheneva (Marketing Management) have received a Spring 2018 Krannert Certificate for Outstanding Teaching. Abigail Banan (Principles of Economics), and Alexander Lyshevski (Principles of Economics) have received a Spring 2018 Krannert Certificate for Distinguished Recitation Teaching. Marcus Richards (Principles of Economics) has received a Spring 2018 Krannert Certificate for Outstanding Recitation Teaching. Moonsik Shin (Strategic Management), Xing Fang (Marketing Management), Jongsoo Kim (International Management), Chengzhang Li (Operations Management), and Zhongjie Ma (Operations Management) have received a Fall 2017 Krannert Certificate for Distinguished Teaching. Tianfu Wang (Marketing Management) has received a Fall 2017 Krannert Certificate for Outstanding Teaching. Daniel Kebede (Principles of Economics) has received a Fall 2017 Krannert Certificate for Distinguished Recitation Teaching. Alexander Lyshevski (Principles of Economics), and Marcus Richards (Principles of Economics) have received a Fall 2017 Krannert Certificate for Outstanding Recitation Teaching. 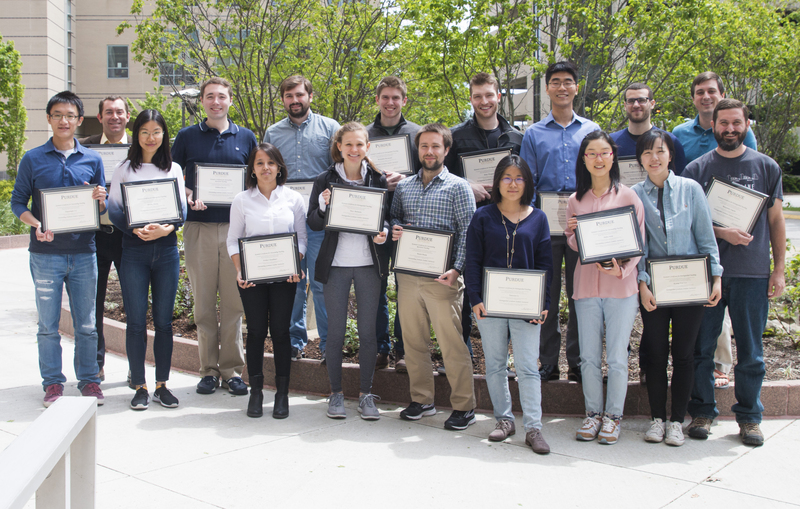 Benjamin Angelo (Management Accounting), Svetlana Beilfuss (Microeconomics), Stanton Hudja (Microeconomics), Mitchell Johnston (Financial Management), Kyung Yun Lee (Introductory Accounting), Zhongjie Ma (Operations Management), Abhishek Ray (Management and Information Systems), and Daniel Woods (Game Theory) have received a Summer 2017 Krannert Certificate for Distinguished Teaching. Adarsh Barik (Business Statistics), Tingmingke Lu (Microeconomics), Yifei Xu (Microeconomics), Wanqing Zhang (Marketing Management), and Haiqing Zhao (Macroeconomics) have received a Summer 2017 Krannert Certificate for Outstanding Teaching. Yang Wang (Management Information Systems), Hongzhi Chen (Human Resource Management), Roger Thomas Godwin (Tax Accounting), Roger Thomas Godwin (Practicum in Taxation), and Catherine Kleshinski (Introduction to Organizational Behavior) have received a Spring 2017 Krannert Certificate for Distinguished Teaching. Benjamin Angelo (Management Accounting) has received a Spring 2017 Krannert Certificate for Outstanding Teaching. Chen Wei (Principles of Economics) has received a Spring 2017 Krannert Certificate for Distinguished Recitation Teaching. Town Oh (Principles of Economics) has received a Spring 2017 Krannert Certificate for Outstanding Recitation Teaching. Mohammed Alyakoob (Management Information Systems), Kubilay Cirik (Strategic Management), Roger Thomas Godwin (Tax Accounting), Jongsoo Kim (International Management), and Xue Wang (Financial Management) have received a Fall 2016 Krannert Certificate for Distinguished Teaching. Jinhee Kim (Financial Management), Samer Ryan Semaan (Introduction to Financial Management), and Tianfu Wang (Marketing Management) have received a Fall 2016 Krannert Certificate for Outstanding Teaching. Conner Smith (Principles of Economics) has received a Fall 2016 Krannert Certificate for Distinguished Recitation Teaching. Daniel Bonin (Principles of Economics), William Brown (Principles of Economics), Debasmita Das (Principles of Economics), Aaron Fehl (Principles of Economics), and Mason Reasner (Principles of Economics) have received a Fall 2016 Krannert Certificate for Outstanding Recitation Teaching. Mohammed Alyakoob (Management Information Systems), Benjamin Angelo (Management Accounting I), Mary Batistich (Microeconomics), Hongzhi Chen (Human Resource Management), Kory Garner (Game Theory), Kyung Yun Lee (Introductory Accounting), Chengzhang Li (Operations Management), Xiaoxiao Li (Intermediate Microeconomic Theory), Martina Loderer (Marketing Management), Benjamin Pratt (Introduction to Organizational Behavior), Benjamin Raymond (Macroeconomics), Peter Wagner (Behavioral Economics), and Jiatong Zhong (International Trade) have each received a Summer 2016 Krannert Certificate for Distinguished Teaching. Pritha Chaudhuri (Microeconomics), Jinhee Kim (Financial Management), and Tingmingke Lu (Macroeconomics) have received a Summer 2016 Krannert Certificate for Outstanding Teaching. Jacklyn Buhrmann (Macroeconomics), Kory Garner (Game Theory), Roger Thomas Godwin (Tax Accounting), Jongsoo Kim (Strategic Management), Justine Mallatt (Macroeconomics), and Didun Peng (Management Science) have each received a Spring 2016 Krannert Certificate for Distinguished Teaching. Stefano Cassella (Investment Management), Andrew Compton (Macroeconomics), Taotao He (Business Statistics), and Wenshu Zhang (Marketing Management) have each received a Spring 2016 Krannert Certificate for Outstanding Teaching. Svetlana Beilfuss (Principles of Economics) has received a Spring 2016 Krannert Certificate for Distinguished Recitation Teaching. Jared Law-Penrose, and Jacob Brindley have each received a 2016 Teaching Academy Graduate Teaching Award. Roger Thomas Godwin (Tax Accounting), Kendall Kennedy (Microeconomics), and Samer Ryan Semaan (Financial Management) ﻿ have each received a Fall 2015 Krannert Certificate for Distinguished Teaching. Andrew Compton (Macroeconomics), Justine Mallat (Macroeconomics), Ho Jung Yoon (Marketing Management) and Jiatong Zhong (Macroeconomics) have each received a Fall 2015 Krannert Certificate for Outstanding Teaching. Darwin Brack (Principles of Economics) and Brandon Norton (Principles of Economics) has received a Fall 2015 Krannert Certificate for Outstanding Recitation Teaching. James Bland (Econometrics), Amanda Cook (Macroeconomics), Lin Hou (Microeconomics), Warut Khern-Am-Nuai (Management Information Systems), Jaewoo Kim (Human Resources), Kyung Yun Lee (Accounting), Heejong Lim (Operations), Sebastian Linde (Game Theory), Justine Mallat (Macroeconomics), Paul Ordyna (Accounting), Seong Kyoung Shin (Marketing), Lusi Wu (Organizational Behavior), Kan Yue (Economics), and Jiatong Zhong (Macroeconomics)﻿ have each received a Summer 2015 Krannert Certificate for Distinguished Teaching. Benjamin Angelo (Accounting), Kendall Kennedy (Microeconomics), Jacklyn Buhrmann (Macroeconomics), and Andrew Compton (Macroeconomics) have each received a Summer 2015 Krannert Certificate for Outstanding Teaching. Xiaoxiao Li (Intermediate Macroeconomics), Andrew Meisner (Game Theory), Kelly Murphy (Microeconomics), Steven Sibley (Investment Management), and Paul Thomas (Macroeconomics) have each received a Spring 2015 Krannert Certificate for Distinguished Teaching. Jacklyn Buhrmann (Macroeconomics), Mariya Brussevich (Microeconomics), David Franco (Financial Management), Lin Hou (Microeconomics), Tao Jiang (Management Science), Kellie Konsor (Principles of Economics), William O'Brien (Financial Management), Brian Towell (Macroeconomics), and Ho Jung Yoon (Marketing Management) have each received a Spring 2015 Krannert Certificate for Outstanding Teaching. Clint Harris (Principles of Economics), and Benjamin Raymond (Principles of Economics) have each received a Spring 2015 Krannert Certificate for Distinguished Recitation Teaching. Pritha Chaudhuri (Principles of Economics) has received a Spring 2015 Krannert Certificate for Outstanding Recitation Teaching. Jacob Brindley (Microeconomics), Mariya Brussevich (Microeconomics), Goran Calic (Strategic Management), Amanda Cook (Intermediate Macroeconomics), Kelly Murphy (Microeconomics), Ho Jung Yoon (Marketing Management), Kan Yue (International Trade), have each received a Fall 2014 Krannert Certificate for Distinguished Teaching. Suprabha Baniya (Macroeconomics), Jacklyn Buhrmann (Macroeconomics), Kellie Konsor (Principles of Economics), Brian Towell (Macroeconomics), Aditya Vedantam (Operations Management) have each received a Fall 2014 Krannert Certificate for Outstanding Teaching. Emily Baker (Principles of Economics) has received a Fall 2014 Krannert Certificate for Distinguished Recitation Teaching. Brittany Barton (Principles of Economics), and Pritha Chaudhuri (Principles of Economics) have received a Fall 2014 Krannert Certificate for Outstanding Recitation Teaching. James Bland (Behavioral Economics), Mariya Brussevich (Microeconomics), Amanda Cook (Intermediate Macroeconomics), Jared Law-Penrose (Human Resource Management), Sebastian Linde (Game Theory), Andrew Meisner (Microeconomics), Paul Ordyna (Introductory Accounting), Matthew Perrigino (Introduction to Organizational Behavior), Evan Totty (Macroeconomics), Kan Yue (International Trade), and Sebastian Wai (Industrial Organization) have received a Summer 2014 Krannert Certificate for Distinguished Teaching. Suprabha Baniya (Macroeconomics), Jacob Brindley (Microeconomics), Stuti Jha (Intermediate Microeconomic Theory), Jinhak Kim (Business Statistics), Kellie Konsor (Principles of Economics), Harold Lopez (Introductory Accounting), Kelly Murphy (Microeconomics), Paul Thomas (Macroeconomics), Sebastian Wai (Industrial Organization), Xue Wang (Financial Management), and Na Zhang (Management & Information Systems) have received a Summer 2014 Krannert Certificate for Outstanding Teaching. Arthur “Andy” Alexander (Management Science), Goran Calic (Entrepreneurship), Chineze Christopher (Microeconomics), and Sebastian Wai (Industrial Organization) have each received a Spring 2014 Krannert Certificate for Distinguished Teaching. Curtis Ball (Game Theory), Marcelo Castillo (Microeconomics), Amanda Cook (Microeconomics), Eric Houff (Macroeconomics), and Wenshu Zhang (Marketing Management) have each received a Spring 2014 Krannert Certificate for Outstanding Teaching. Justine Mallatt (Economics), Donald O’Malley (Economics), and Peter Wagner (Economics) have each received a Spring 2014 Krannert Certificate for Distinguished Recitation Teaching. Evan Totty (Macroeconomics), Steven Sibley (Investment Management), Xiaoxiao Li (Macroeconomics), Kellie Konsor (Macroeconomics), Jacob Brindley (Microeconomics), and Amanda Cook (Microeconomics) have each received a Fall 2013 Krannert Certificate for Distinguished Teaching. Xinyan Zhao (Human Resources) has received a Fall 2013 Krannert Certificate for Outstanding Teaching. Jacklyn Buhrmann (Economics), Andrew Compton (Economics), Kendall Kennedy (Economics), and Eric Houff (Economics) have each received a Fall 2013 Krannert Certificate for Outstanding Recitation Teaching. William O’Brien (Finance), Paul Ordyna (Accounting), Jared Law-Penrose (Human Resources), Xiaoxiao Li (Macroeconomics), Zachary Davis (Macroeconomics), Jinhak Kim (Statistics), Kellie Konsor (Macroeconomics), Amanda Cook (Microeconomics), Curtis Ball (Game Theory), Sebastian Wai (Industrial Organization), Matthew Perrigino (Organizational Behavior), and Jacob Brindley (Microeconomics) have each received a Summer 2013 Krannert Certificate for Distinguished Teaching. Marcelo Castillo (Macroeconomics), Chineze Christopher (Macroeconomics), Zhiying Gu (Microeconomics), Koeun Park (Accounting), Yiqiao Sun (Operation), Evan Totty (Macroeconomics), and Wenshu Zhang (Marketing) have each received a Summer 2013 Krannert Certificate for Outstanding Teaching. Arthur “Andy” Alexander (Management Science), Joshua “Josh” Austin (Industrial Organization), Mihai Ion (Finance), Jeremiah Harris (Microeconomics), Moumita Roy (Macroeconomics), Wonsang Ryu (Strategic Management), and Huanren Zhang (Econometrics) have each received a Spring 2013 Krannert Certificate for Distinguished Teaching. Sunah Kim (Marketing), Fatemeh Momeni (Macroeconomics), Chong Hyun Park (Management Science), Brittany Teahan (Economics; Microeconomics), Jing Wang (Finance), and Ho Jung Yoon (Marketing) have each received a Spring 2013 Krannert Certificate for Outstanding Teaching. Andrew Meisner (Economics) and Kan Yue (Economics) have each received a Spring 2013 Krannert Certificate for Distinguished Recitation Teaching. Kelly Murphy (Economics), Paul Thomas (Economics), and Brian Towell (Economics) have each received a Spring 2013 Krannert Certificate for Outstanding Recitation Teaching. Huanren Zhang (Econometrics), Brittany Teahan (Microeconomics), Patrick Bruning (Organizational Behavior), and Christopher Hartwell (Human Resources) have each received a Fall 2012 Krannert Certificate for Distinguished Teaching. Chineze Christopher (Microeconomics), Zachary Davis (Macroeconomics), and Marcelo Castillo (Macroeconomics) have each received a Fall 2012 Krannert Certificate for Outstanding Teaching. Suprabha Baniya (Economics) and Sebastian Linde (Economics) have each received a Fall 2012 Krannert Certificate for Distinguished Recitation Teaching. James Bland (Economics) and Mariya Brussevich (Economics) have each received a Fall 2012 Krannert Certificate for Outstanding Recitation Teaching. Jaehong Kim (Macroeconomics), Fatemeh Momeni (Economics), KoEun Park (Accounting), Weijia Wang (Statistics), Soyoung Yang (Information Systems), Chengxi Yin (Finance), Ho Jung Yoon (Marketing), and Huanren Zhang (Microeconomics) have each received a Summer 2012 Krannert Certificate for Distinguished Teaching. Marcella Castillo (Macroeconomics) and Chineze Christopher (Microeconomics) have each received a Summer 2012 Krannert Certificate for Outstanding Teaching. Yuriy Bots (Macroeconomics), Vusal Eminli (Macroeconomics), Kory Garner (Microeconomics), Jeremiah Harris (Microeconomics), Moumita Roy (Macroeconomics), Aditya Vedantam (Operations), and Chengxi (Adam) Yin (Finance) have each received a Spring 2012 Krannert Certificate for Distinguished Teaching. Hailiang Chen (Information Systems), Huanhuan Ji (Information Systems), Weijia Wang (Statistics), and JianQing (Fisher) Wu (Information Systems) have each received a Spring 2012 Krannert Certificate for Outstanding Teaching. Kellie Konsor (Economics), Xiaoxiao Li (Economics), Evan Totty (Economics), and Sebastian Wai (Economics) have each received a Spring 2012 Krannert Certificate for Distinguished Recitation Teaching. Hailing Chen (Information Systems), Justin Krieg (Microeconomics), Kwan Yong Lee (Macroeconomics), and Katie Schultz (Labor Economics) have each received a Fall 2011 Krannert Certificate for Distinguished Teaching. Joshua Austin (Macroeconomics), Mona Bahl (Strategic Management), Ji Hong Min (Marketing), and Brittany Teahan (Microeconomics) have each received a Fall 2011 Krannert Certificate for Outstanding Teaching. Jacob Bindley (Economics) and Alexander Garivaltis (Economics) have each received a Fall 2011 Krannert Certificate for Distinguished Recitation Teaching. Curtis Ball (Economics) and Kellie Konsor (Economics) have each received a Fall 2011 Krannert Certificate for Outstanding Recitation Teaching.